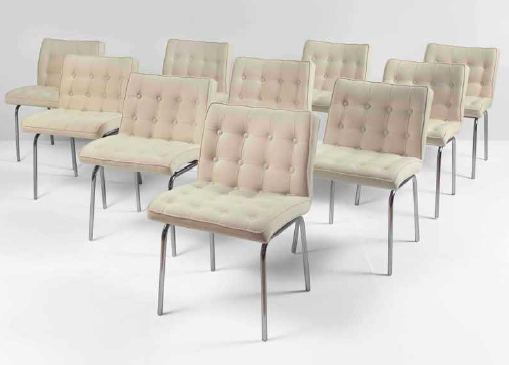 Set of 10 chairs, model ’62’. Edition Charron, 1962. Chromed metal, foam and fabric. Photo courtesy of Galerie Pascal Cuisinier. René-Jean Caillette, the son of an ebeniste and graduate in 1937 of the Ecole Nationale Supérieure des Arts Appliqués, was a pioneer of modern French design. With a focus on simplicity of line and functionality, and with the aim to make modern design accessible to everyone, Caillette’s goal was to create quality mass production furniture. One of his aims was to create signed furniture which would be sold at the same price in all of France. He was one of the founders of ACMC (l’Association des Créateurs de Mobilier de Série) which defended the rights of this budding movement. 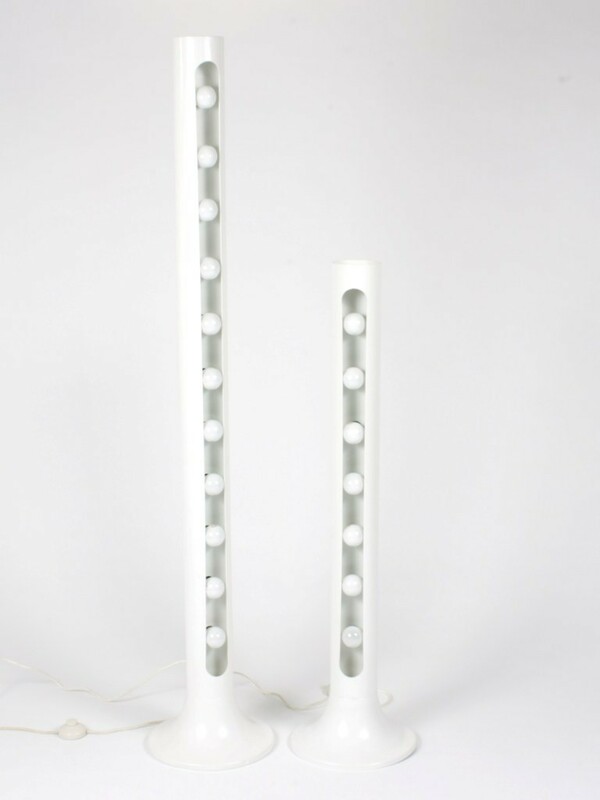 He experimented with new materials which became available at the time such as plywood, stainless steel, rattan and perspex. His work is characterized by clean, taut lines and rigorous shapes. 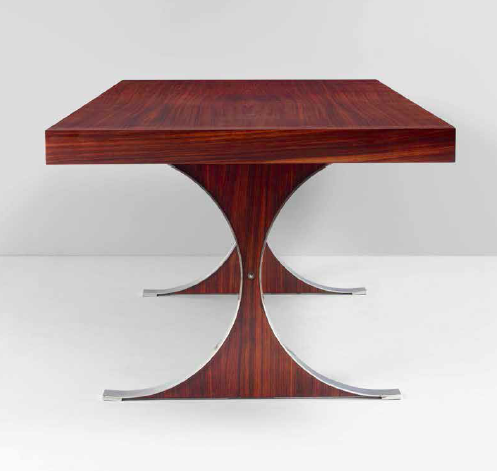 Sylvie table, Charron edition, 1961. Rio rosewood and chromed metal. This model was presented at the Salon des Arts Ménagers in 1961. Photo courtesy of Galerie Pascal Cuisinier. Caillette was very active in design circles in Paris in the 1940s and 50s. In 1949 he organized a prestigious exhibition between the rue du Faubourg Saint Honoré and the rue Royale in Paris. It gathered together young designers who became known as the group Saint Honoré. This movement created solidarity and cohesion and created a focus for the designers. 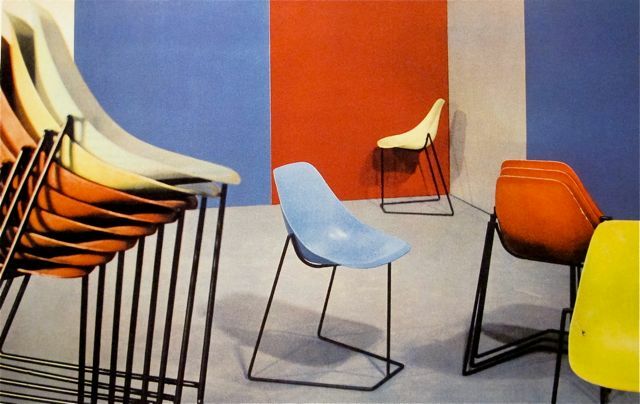 And in 1954, together with George Charron, a French furniture manufacturer, Caillette formed ‘Groupe 4’ with fellow designers Alain Richard, Genevieve Dangles and Joseph André Motte. 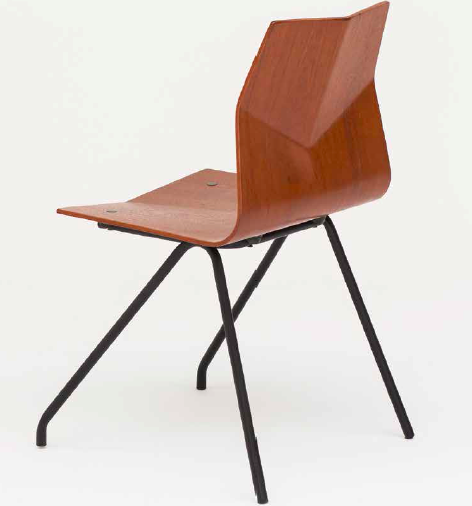 One of a pair of ‘Diamant’ chairs, design 1958/Steiner edition 1961. Plywood, Lacquered and chromed metal. This chair received the Gold Medal at the Brussels Universal Exhibition, French Pavilion in 1958. The ‘Diamant’ Chair’ (above), for which Caillette received the silver medal at the Milan Triennale in 1962, is one of his best known pieces. “It is the most pure and the most easy to fabricate of my models in molded plywood. I designed it with a piece of cardboard, telling myself that if the cardboard could fold, then so could wood.” Sober and elegant, it remains one of the signature pieces of French post-war design. 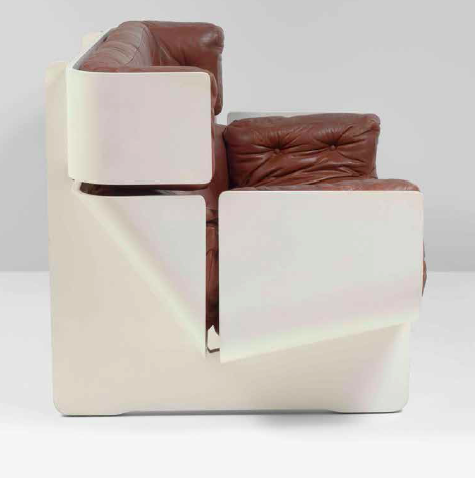 This two-seater sofa in molded and lacquered plywood and leather was presented at the Salon des Arts Ménagers in 1966. Charron edition. Unique piece. Photo courtesy of Galerie Pascal Cuisinier. When Caillette died in 2005 he left his substantial body of work to the ‘Petits Freres des Pauvres’ Association. His work regained recognition as being at the forefront of French historic design when it was offered for sale at Tajan auction house in Paris in 2006. Don’t miss the wonderful exhibition at Galerie Pascal Cuisinier. Runs through to 22 October 2016.